Provide a short message for the meeting planner, telling them about the benefits you provide to the audience in your keynotes. Share your life experiences that make you qualified to present. Leave them with a taste of your personality and the impression that you are the ideal keynote speaker for their event. Meeting and event planners want to see you in action. Give them what they want by providing a preview video of you sharing one of your keynotes on stage at a recent event. This would also be an appropriate place to share a demo video that includes edited reel footage of your speaking combined with testimonials and you talking face to face with the camera about the benefits you offer. Share a little detail about your keynote topics and what audiences should expect to take away from your speeches. Make sure to focus on the benefits for them. What do you provide to the meeting planners in advance, during, and after your appearance? Most speakers partner with meeting planners by communicating in the weeks leading up to the event so that they understand the mission. They provide resources and tools to make a meeting planner’s job easier and even stylize their performance fit the audience type. Meeting planners often publish material prior to an event that includes an image and bio of the speaker(s) who will be presenting. You’ll want to make it as easy as possible for a speaker to book you by having all of the resources they could need right at their fingertips. All they should have to do is click to download high-resolution, professional images of you, which they can use for promotion purposes. One of the biggest pieces of the social-proof puzzle is the testimonial. If you provide raving reviews, meeting planners will have a hard time clicking off your page in search of someone else. Ask meeting planners, executives, and audience members to write a review (or even better, film them giving a video testimonial) right after your presentation when they are excited about what you had to sayand very pleased with the action steps you’ve provided. The result will be testimonials that glow with your praises. 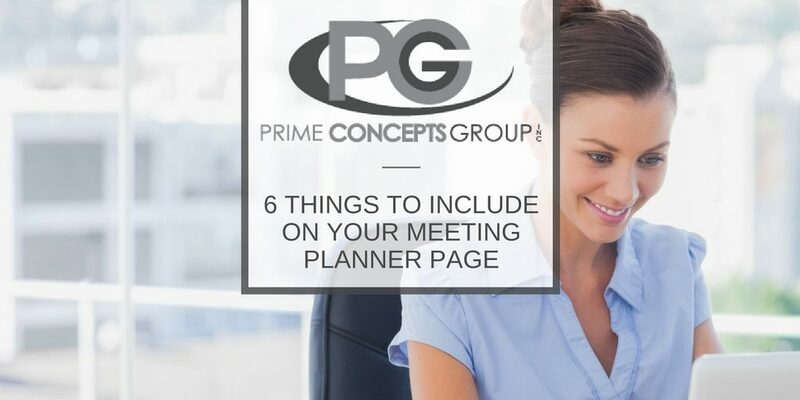 Pepper them throughout your site, but don’t forget to include a few on your meeting planner page. Include a speaker callout box that gathers all of the important details a meeting planner will need when they decide to bring you into their organization. This section should include a few documents in PDF format: your speaker introduction, A/V Requirements, and Pre-program Questionnaire. This makes it even simpler for a meeting planner to make the decision to book you. Steve Rizzo’s site is a great example that includes all of these aspects. Everyone appreciates those who make their lives easier, so by creating a visually-pleasing and valuable information-filled meeting planner page, you’re already off to a great start. If you’re struggling to get it just right, please don’t hesitate to ask for help. That’s what we’re here for. Just call Prime Concepts Group at 316-942-1111 and we can take the stress off your shoulders when it comes to designing and developing an effect and stunning speaker website. 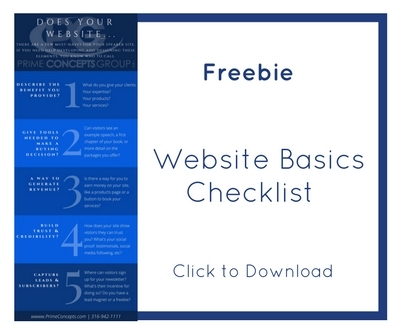 And if you’re still struggling with your homepage and want to try to problem-solve on your own, check out our website basics checklist for what you need to include.